Hi Guys!! 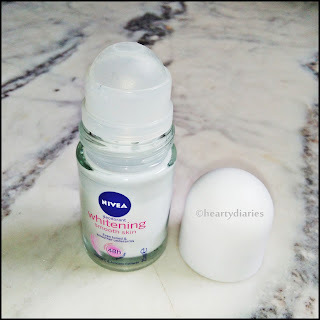 This is my first review on this blog and I just feel like posting it.. When I made this blog, I just wanted to express myself but the niche of the blog was undecided. 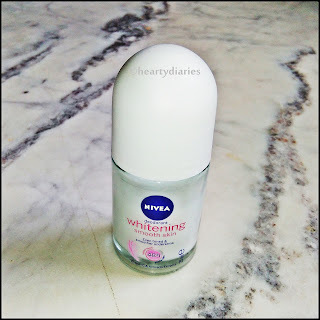 I don’t know whats coming further on my Hearty Diaries but today I feel like sharing my opinion about Nivea Whitening Smooth Skin Deodorant Roll-on with you guys because it has been there with me for about six months now.. There are some pros as well as cons of this product! So keep on reading till the end! I hope I am able to help you..
Packaging: This deodorant comes in approx four inch sized glass bottle with a hard plastic, white screw cap and a plastic roll on which makes the application quite smooth. The overall packaging of this product is good and leak proof but I wish it was not made up of glass, thus making it light weight, safe and easy to travel with. 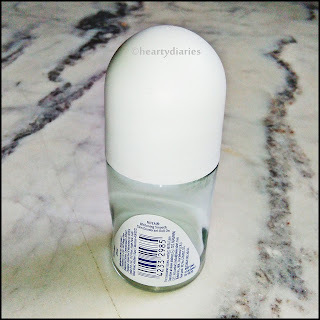 My Experience: My experience with this deodorant has always been a great one. When I bought it, I never thought it would be my best friend! I’ve been using this deo for about six months now and the quantity and quality both are great. The plastic roll on is very easy to work with and you get a good amount of product once you roll it. This deo takes a little longer to get absorbed in to the skin (for about two minutes) as compared to other spray like deodorants but once it is done, it feels really feathery and good. The pleasant fragrance which is neither too strong nor too light stays about for the entire day. Now coming to the results, I had high expectations with this product because that’s what you generally expect from Nivea. This deo has given me an amazing result, more than I expected and does what it claims to. I’ve been using it for a long time now and I could see my dark underarms getting fairer and even toned within few days. Even though this product cannot be replaced with a spray deodorant which can be applied even in a hurry, I have quite sensitive skin and this is the perfect product for me. I always apply it after shower and enjoy the great results and sweet fragrance the entire day. The quantity is just amazing and lasts really long. It doesn’t cause any irritation and I personally use it on my knees and elbow as well. Of course yes as it has given me the underarms I always desired for. Apart from underarms, I also applied it to my knees and elbows and found really appreciable results. I would definitely go and grab another one, once I finish off this bottle. Yes!! This is such a great product that I highly recommend it. Yes! This deodorant does what it claims and the results are really satisfying. So it is highly worth the price point. Final thoughts: It is a product worth trying and has given me satisfactory results within 2 weeks of using it. I use it after shower and let it get absorbed into my skin for a minute and then enjoy the sweet and fruity fragrance entire day. I would love it if the packaging is improved and the bottle is of metal or plastic. I would also prefer this above a spray deodorant as my skin is quite sensitive. I would recommend it to everyone out there who is saddened after using hair removal creams and want fair underarms. So thats it for today guys!! I hope this post was helpful to you.. Do let me know by commenting below. Don’t forget to share this post and follow my blog.. Thank you for mentioning all pros and cons. Very much useful. This product is ideal for women but I believe it would even work if men try it but it may take longer as a woman's skin is much smoother and softer than a man's… Good luck! This product is ideal for men or women?